Colorful, eye-catching design is made from plywood and miniature lights using only a hand-held jigsaw and a drill. Make the Angel with arms down, arms up with PEACE above, or both when you add our two Channel Light Controller (below). Use this clever controller to add the exciting look of action to your lighted yard displays (as in the projects below) or simply alternate the power between two different displays or two strings of lights on a Christmas tree. 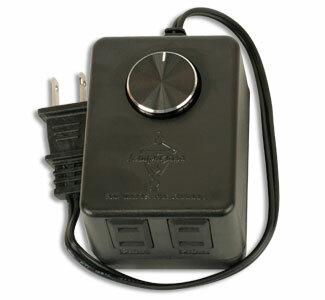 Indoor/Outdoor Controller plugs directly into a 110 volt outlet. Light sets for each channel plug into the bottom. Power alternates between the two channels, gradually increasing to maximum then fading to zero. Speed knob controls the timing between cycles. Maximum load rating is 2.5 amps, 300 watts per channel. This is equivalent to using 6 sets of 100 extra bright (.2amp) bulbs in series. PLEASE NOTE: LED lights may not be compatable with our Fader. Be sure to read the manufacturer's recommendations before purchasing them to use with our Light Fader.